Zagat and Michelin guide recommended. Applewood Inn Bed & Breakfast, with it's acclaimed wine country restaurant, is a popular Sonoma County destination for food and wine enthusiasts seeking a getaway to Sonoma County's idyllic Russian River Valley. 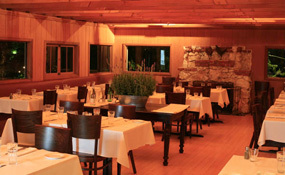 The restaurant at Dawn Ranch, Agriculture Public House, truly brings the Farm to your table. Serving local craft beer, Russian River Wines, and small batch spirits. Dawn Ranch has private river access, a pool, and wireless internet access. There are no phones or televisions in rooms in case you would like to unplug for a week or two. So leave your problems behind and join us for a party, a wedding, family reunion, corporate retreat, or just some peace and solitude. Don’t forget the dog and a good book, we will supply the rest. There are many wonderful dining opportunities in Guerneville and the surrounding towns that range from casual and delicious to award wining California wine country cuisine.